As summer transitions to fall and the start of what we know will be an exciting academic year for our Catholic schools in Brooklyn and Queens, I hope you will bookmark our revamped website and return frequently for updates. Due to your kindness and benevolence, and so many others like you, Futures In Education is no longer the best kept secret for Catholic school fundraising. As a professional fundraiser for over 15 years, I go to work each day with the mantra of “Relationships Determine Results.” One of our many goals is to make sure that no child will be denied a Catholic school education due to financial constraints. While we have work to do, I look forward to that day when I can report to you that our goal has been realized. The journey is worth the reward for those students entrusted to our care. Please know that your generosity, no matter the amount, is crucial to our efforts to support the over 90-plus Catholic schools in the Brooklyn Diocese. In fact, if you have yet to make a gift in 2013, I hope this column will serve as an incentive to do so … again and again. When is the Futures Scholarships Dinner? This year, the Dinner is slated for Wednesday, October 9, at the world-famous Waldorf Astoria New York honoring New York City police commissioner Ray Kelly and Anthony Bonomo, J.D., Chief Executive Officer of PRI/Administrators for the Professions. The evening is hosted by television legend Rosanna Scotto. For more information on tables, tickets and sponsorship opportunities, please visit http://www.futuresdinner.org. Can I host a fundraising reception? This question is always my favorite! If you would like to host a reception, please do not hesitate to contact me at 718-965-7300 ext. 1624 or via e-mail at nvendikos@cfbq.org. Often benefactors host home, office or parish gatherings to inform friends, family members and colleagues about Futures In Education, and the many programs and educational initiatives we fund. These events allow Futures to expand its network of support while at the same time educate even more people about the successes of Catholic education. How do I become a member of the Fons Vitae Society? 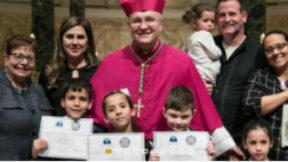 The Fons Vitae Society is the Brooklyn Diocese’s “Planned Giving” group as its gifts are designated for legacy intentions. Gifts can be made through trusts, charitable gift annuities, bequests, life insurance and real estate. These types of gifts to Futures In Education qualify an individual for lifetime membership into the Fons Vitae Society. While planned giving is an essential part of our fundraising efforts, we also ask those benefactors interested in becoming Fons Vitae Society members to continue their annual support via gifts of cash or stock.